As a gateway to the Southwestern provinces, with a population of over 1.7 million people, Tien Giang holds an important position in economic, cultural, social, defense, security fields of the Mekong delta. Over the past years, the province has focused on leading and directing to implement synchronously a number of measures in order to make a significant changes in the local military and defense work, creating a firm ground for socio-economic development and defense and security consolidation. Strengthening defense and security education is considered one of the important solutions. First, the province attaches importance to fulfilling and enhancing the effectiveness of the councils for defense and security education at all levels, making sure that their structures do have members from branches regulated by law. Besides, it proactively fosters education to enhance the capability in giving advice, direction, guidelines and supervision for each member, particularly after party congresses and elections deputies to the people’s councils at all levels for the 2016 – 2021 term. Thereby, the quality of guiding documents is improved; the whole political system is mobilized for defense and security education. there are progresses in the task of skill training for members of the provincial council for defense and security council, hence raising their knowledge and responsibility at work. As the permanent office of the provincial defense and security education council, the Provincial Military Command has always performed well its core advisory role in coordinating with other departments and organizations of the province to help the provincial party committee, people’s council and people’s committee implement projects and plans on defense and security education in the province. Notably, since 2015, the Provincial Military Command has directed its junior commands and units to seriously implement the Circular 14/2014/TT-BQP of the Ministry of National Defense on training officers and party members in the Military on defense and security to create favorable conditions for the provincial armed forces to fulfill their military and defense tasks in general and the defense and security education in particular. Military commands at all levels have promoted their functions, successfully conducting their advisory role for party committee and authority at relevant levels on how to enhance the state management on and effective implementation defense and security education. To date, 100% of the offices and units have opened defense and security courses for their cadres and party members. Moreover, the province also attaches importance to developing defense and security knowledge for its staff at departments and branches. On the basis of the defense and security training program for different groups, the province further study and supplement content to make it relevant with the local reality and learners. The supplementary contents focus on basic and core matter as well as new points in the Party’s guidelines on defense and security, especially urgent issues faced by the locality, situation and mission of grassroots level, etc. Regarding methodology, the province integrates the education with specialized activities of each department and level, emulation movements, and defensive area exercises. Thereby, the key cadres at levels and of branches have raised their awareness and responsibility contributing to strengthening efficacy and effectiveness of state management over defense and security. In addition, the provincial defense and security educational center and localities have also opened 05 defense and security short courses for 426 religious dignitaries, thereby consolidating the national unity bloc, contributing to the maintenance of political security, social safety, and order. In order to successfully conduct defense and security education for students, the province directs its education and training department, schools and specialized agencies to proactively choose candidates to participate in defense and security instructors’ training courses. 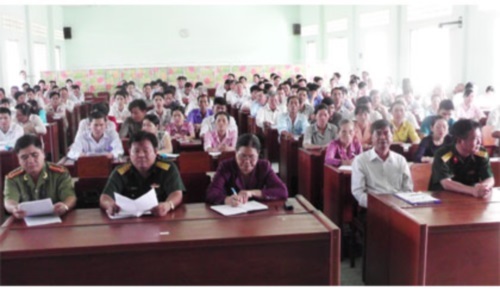 Besides, military commands also actively hold extra training courses for teachers and deploy their cadres to schools. With the involvement of political and social organizations, such as: the Youth Union, the Women’s Association, the Veterans’ Association, etc. there have been new and interesting forms and methods of education, such as: educating the local revolutionary tradition combined with conducting the visits to historical relics, holding competitions on defense and security activities…. By September 2016, the province has completed the training courses for more than 42,000 students. Accordingly, students not only develop necessary military skills but also nurture good ethics, personality, strong sense of discipline, patriotism, and high sense of responsibility for the cause of national construction and defense. The task of disseminating defense and security knowledge to the entire people has been implemented in a comprehensive, regular, and suitable manner. The Provincial defense and security educational council coordinates with the Provincial publicity and educational commission, the provincial information and communication department, and local presses to build plans and programs for training reporters and editors of press agencies on strengthening propagation on mass media. The propagation contents are about viewpoints and guidelines of the Party, policies and laws of the State on defense and security, particularly Vietnam’s sovereignty and sovereignty rights over the East Sea. Through the propagation, the province has timely praised the achievements and exemplary models in defense and security activities and the mass movement for protecting national security. Furthermore, official information is also provided to refute the “peaceful evolution” plots of hostile forces and orient the public. Thereby, people’s belief in the Party, State and regime is consolidated; their responsibility in building the entire people’s defense and people’s security is upheld. In the coming time, the province will continue to strengthen defense and security education in association with the implementation of the Resolution of the 12th National Congress of the Party and the Directive 05-CT/TW of the Politburo (XII tenure) on studying and following Ho Chi Minh thought, moral and style; thereby developing patriotism and national pride, tapping the huge strength of the national unity bloc, upholding the strengths, potentials to create a robust momentum for the fast and sustainable growth of Tien Giang.